Superb glass never goes out of style. Great glass endures. That's why Nikon cameras—from the Nikon F in 1959 all the way to D850—have remained compatible with nearly all F-mount NIKKOR lenses. Why would things be any different with the Nikon Z? The Mount Adapter FTZ lets you keep shooting the lenses you know and love while also gaining the benefits of the new Z system. The legacy of compatibility continues. Teach your favorite lenses some new tricks. Proven optics meet the latest imaging advancements. 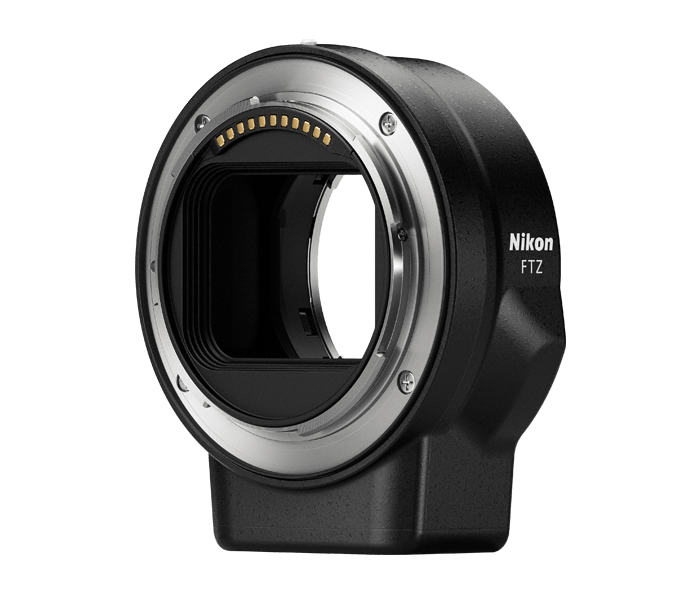 On a Z camera with the Mount Adapter FTZ, compatible F-Mount NIKKOR lenses retain all of their sharpness and superb rendering power. Plus, they gain so much—smooth, fast Hybrid-AF*, silent shooting, breakthrough low-light performance, the benefits of the camera's built-in VR image stabilization and more. On a Z camera, every lens has VR. For the first time, you can experience fast aperture NIKKOR primes like the AF-S NIKKOR 105mm f/1.4E ED or AF-S NIKKOR 24mm f/1.4G ED with up to 5 stops of 3-axis VR image stabilization. NIKKOR lenses that already have VR, like the AF-S NIKKOR 70-200mm f/2.8E FL ED VR, get the added benefit of roll axis for a total of 3-axis VR. Just add the optional Mount Adapter FTZ and you're good to go. NOTE: Many non-CPU lenses can also benefit from in-camera VR when registering the focal length into the camera. Camera and lens in harmony. Compatible with a huge selection of NIKKOR lenses. The Mount Adapter FTZ works with approx. 360 lenses in total, 90 of which are AF-S, AF-P or AF-I type and have full AF/AE capability. **If the F-mount lens you're using has its own tripod mount, use it instead of the tripod mount of the Mount Adapter FTZ. Use the F-Mount NIKKOR lenses you love on Nikon Z mirrorless cameras. This precisely engineered adapter is the bridge between the larger Z Mount and approx. 360 lenses in total, which retain all of their superb image quality and gain the benefits of the Z system like in-camera VR, fast, smooth Hybrid AF*, silent shooting, focus peaking and more.